Web traffic is currently one of the most important applications in the Internet. The increasing popularity of dynamically generated content on the World Wide Web, has created the need for fast web servers. Server clustering together with server load balancing has emerged as a promising technique to build scalable web servers. 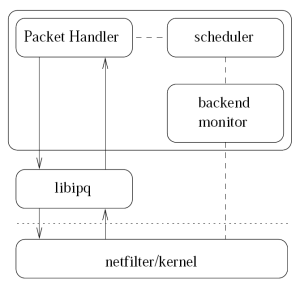 We developed and evaluated Loaded, a userspace server load balancer for IPv4 and IPv6 based on Linux. Loaded was presented at the CeBIT 2004.